KABUL, Afghanistan, April 2, 2018 /PRNewswire/ — The Bayat Foundation (bayatfoundation.org), Afghanistan’s largest, private philanthropic Health, Education and Social Development organization, announced today that the Foundation has completed the construction of The Bayat Institute of Technology (BIT), a new, 32,000 square foot Science and Technology Teaching and Research Center, located at The American University of Afghanistan (AUAF). The Bayat Institute of Technology is located at the heart of AUAF’s flagship campus in Kabul City. 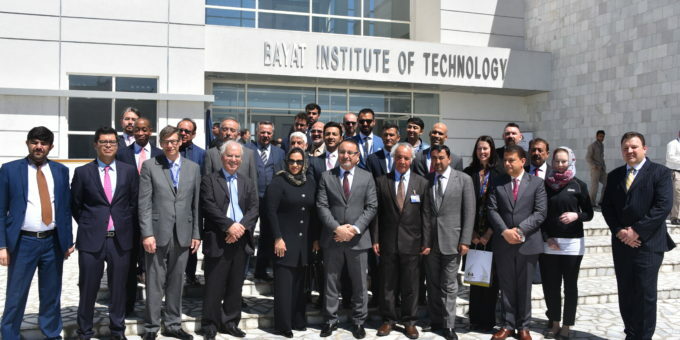 The mission of The Bayat Institute of Technology is to enable members of the AUAF community to undertake rigorous teaching and research which increases Afghanistan’s collective engineering, scientific and technical knowledge, while also providing strong support for Afghan led scientific and technological innovation and entrepreneurship. In addition to underwriting the construction of The Bayat Institute of Technology, The Bayat Foundation has established a ten-year, $1,000,000 endowment fund which will be used to defray the building’s operational costs. The Bayat Institute of Technology’s advanced facilities are contained within the newest and most architecturally distinguished academic building within the region. With its gleaming alabaster colored exterior and its interiors bathed in natural light cascading through the buildings numerous windows, The Bayat Institute of Technology was developed using a portfolio of forward-leaning methods of sustainable design and construction. The building’s centralized Atrium enables the natural circulation of air, and the building’s illumination is provided with a combination of LED lighting and natural light. Repurposed marble, together with gypsum, aluminum and porcelain were incorporated within the building’s earthquake resistant structure. “The Bayat Institute of Technology at The American University of Afghanistan is a powerful example of the partnership between The Bayat Foundation and AUAF—a partnership that is providing AUAF’s students with an academically rigorous and valuable scientific and technical education,” said Dr. Ehsanollah Bayat, the Co-Founder and Chairman of The Bayat Foundation.